Philadelphia-based Keonna Thomas is a propagandist and alleged would-be foreign fighter for ISIS.Associated Press, “Philadelphia Woman Charged In Plot To Join ISIS To Remain Jailed,” ABC 6 Action News, April 9, 2015, http://6abc.com/news/phila-woman-charged-in-plot-to-join-isis-to-remain-jailed/644428/. According to the criminal complaint filed against her, the mother of two used her Twitter account to praise ISIS, and eventually sought to join the terror group.“Criminal Complaint,” United States District Court, Eastern District of Pennsylvania, April 3, 2015, http://media.philly.com/documents/KeonnaThomasComplaint.pdf. The FBI monitored Thomas’s online communications with jihadists abroad between August 2013 and March 2015, which led the bureau to conclude that her intention was to travel to Syria to join ISIS.“Criminal Complaint,” United States District Court, Eastern District of Pennsylvania, April 3, 2015, http://media.philly.com/documents/KeonnaThomasComplaint.pdf. According to the criminal complaint, Thomas applied for a U.S. passport, obtained a Turkish visa, researched travel routes from Spain to Turkey, and purchased airline tickets to travel to Spain.“Criminal Complaint,” United States District Court, Eastern District of Pennsylvania, April 3, 2015, http://media.philly.com/documents/KeonnaThomasComplaint.pdf. On January 4, 2014 she tweeted “Only thing I’m jealous of is when I see the smiles of shuhadaa [martyrs].”“Criminal Complaint,” United States District Court, Eastern District of Pennsylvania, April 3, 2015, http://media.philly.com/documents/KeonnaThomasComplaint.pdf. In April 2015, the FBI collected evidence and arrested Thomas in her Philadelphia home.Jeremy Roebuck, “U.S. : Phil. Woman tried to go to Mideast to support ISIS,” Philly.com, April 5, 2015, http://articles.philly.com/2015-04-05/news/60814497_1_isis-fbi-agents-north-philadelphia. 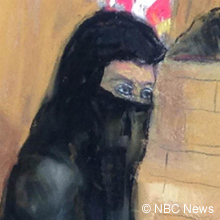 She was charged with one count of attempting to provide material support to a foreign terrorist organization.“Philadelphia Woman Indicted On Charges She Tried to Assist And Join ISIL,” U.S. Attorney’s Office, Eastern District of Pennsylvania, April 23, 2015, http://www.justice.gov/usao-edpa/pr/philadelphia-woman-indicted-charges-she-tried-assist-and-join-isil. Fatayat Al Khilafah“Criminal Complaint,” United States District Court, Eastern District of Pennsylvania, April 3, 2015, http://media.philly.com/documents/KeonnaThomasComplaint.pdf. YoungLioness“Criminal Complaint,” United States District Court, Eastern District of Pennsylvania, April 3, 2015, http://media.philly.com/documents/KeonnaThomasComplaint.pdf. “Deactivated my Twitter till i leave for sham [greater Syria]…. don’t want to draw attention of the kuffar [non-believers] and it mess my plans and they take my pass port and i get stuck here.”“Criminal Complaint,” United States District Court, Eastern District of Pennsylvania, April 3, 2015, http://media.philly.com/documents/KeonnaThomasComplaint.pdf. “If we truly knew the realities … we all would be rushing to join our brothers in the front lines pray ALLAH accept us as shuhada [martyrs].”(Tweet)“Criminal Complaint,” United States District Court, Eastern District of Pennsylvania, April 3, 2015, http://media.philly.com/documents/KeonnaThomasComplaint.pdf. “May Allah Ta Ala [God] give victory to the Muj [violent kihadi fighters] & destroy the kuffar&munabfiqeen [infidels & hypocrites] Ameen.”(Tweet)“Criminal Complaint,” United States District Court, Eastern District of Pennsylvania, April 3, 2015, http://media.philly.com/documents/KeonnaThomasComplaint.pdf. “When you’re a mujahid [violent jihadi fighter] your death becomes a wedding. #HoorAlAyn [pleasures in paradise].”(Tweet)“Criminal Complaint,” United States District Court, Eastern District of Pennsylvania, April 3, 2015, http://media.philly.com/documents/KeonnaThomasComplaint.pdf. “Only thing I’m jealous of is when I see the smiles of shuhadaa [martyrs].”(Tweet)“Criminal Complaint,” United States District Court, Eastern District of Pennsylvania, April 3, 2015, http://media.philly.com/documents/KeonnaThomasComplaint.pdf. “I see why the mujahideen [violent jihadi fighters] Sacrifice Dunya [life on earth] for Akhirah [the after life] theres no comparison.”(Tweet)“Criminal Complaint,” United States District Court, Eastern District of Pennsylvania, April 3, 2015, http://media.philly.com/documents/KeonnaThomasComplaint.pdf. “I have moves to make so I will be spending less time on here….”“Criminal Complaint,” United States District Court, Eastern District of Pennsylvania, April 3, 2015, http://media.philly.com/documents/KeonnaThomasComplaint.pdf. “Plan to leave the land of kufr [non-believers].” “[S]peaking here [online] about certain things is not … wise.”“Criminal Complaint,” United States District Court, Eastern District of Pennsylvania, April 3, 2015, http://media.philly.com/documents/KeonnaThomasComplaint.pdf.